In the next two years, Tom Gunn had made over 800 flights and carried more than 300 passengers. Now in Honolulu, the aviator had three planes of his own design to use. Gunn prepared to give demonstrations such as Hawaii residents had never seen before. On July 5, 1913, his airplane was readied for a demonstration at Schofield Barracks. Calling them vaudeville tricks, Gunn prepared a flying show consisting of volplaning, an aerial mail service demonstration, a “dip of death,” and several speed runs. Gunn also intended to take a resident with him on a passenger-carrying stunt. With the help of his brother, Tom Wing, the flyer put together his biplane for the most daring flying exhibition Hawaii had yet seen. A local tailor and a young lady ticket taker in the Empire Theater each volunteered to ride as passengers. On July 8, Gunn made an impressive 25-minute flight while Army personnel, newsmen, and hundreds of bystanders watched at Schofield Barracks. He made a second flight that day and delighted Wahiawa residents by circling their city. He gave a public demonstration (no charge) at Schofield Barracks on July 13. Following a test flight in the morning, Gunn took up Hawaii’s first airplane passengers after lunch. For safety and passenger concern, he merely skimmed the ground. During the last passenger flight the propeller became damaged and remaining flights had to be called off. Gunn next placed pontoons on his airplane and on October 2 took off from the waters of Honolulu harbor. This was the first such feat in Hawaii. Following the flight, Gunn announced a willingness to take up passengers at $25 apiece. Mrs. Newman, a Honolulu resident, volunteered. She became Hawaii’s first paying airplane passenger during a 15-minute jaunt above the harbor. 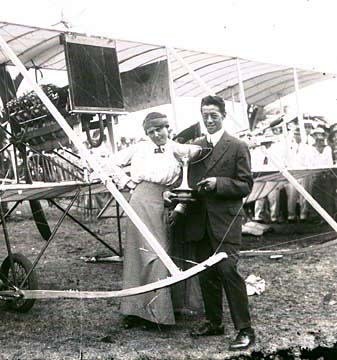 Later, Gunn shipped his craft to the island of Maui where Valley Island residents were given their first view of an airplane in flight. Sponsored by Hawaiian/Japanese newspaper, Nippu Jiji, and the Chinese Athletic Union, the aviator demonstrated at Pearl Harbor in January, 1914. He maneuvered his seaplane both on the water and in the air, while Hedemann Brothers made speed runs (31 mph) in a motor boat. Tom Gunn represented aviation well in Hawaii. He displayed an excellent attitude, flew with skill and versatility. He could be rated a pilot’s pilot, before the complimentary phrase was created. Gunn helped make flying palatable, then exciting.